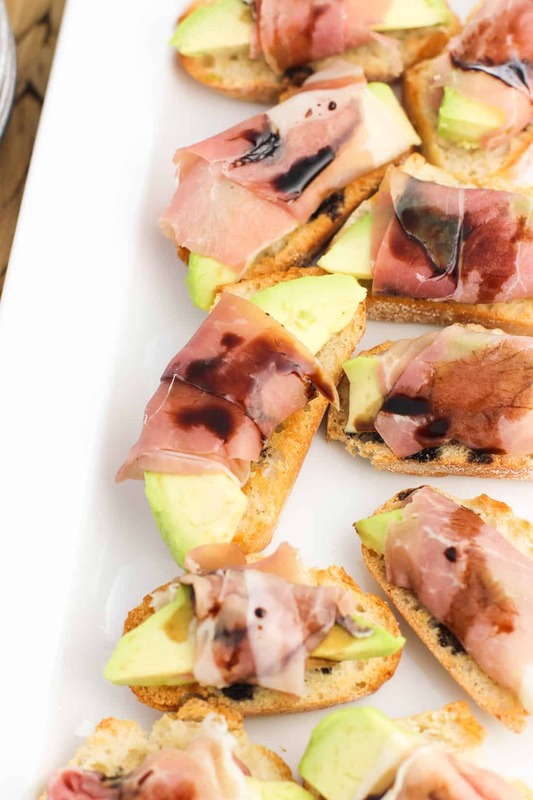 This recipe for prosciutto-wrapped avocado crostini is your next favorite appetizer dish just waiting to happen. Lightly toasted baguette slices are topped with an avocado slice wrapped in prosciutto and drizzled with balsamic glaze. These crostini are crunchy, creamy, salty, and tangy all in one! Crostini make wonderful appetizers — this we know. But they also make the best dinner with a side salad (and a glass of wine). I can personally vouch for the second scenario as we don’t host that many dinner parties in our two-room apartment, so crostini for dinner is a thing I’m familiar with. Who can wait for entertaining for bite-sized appetizers that include all your favorite flavors? As the finishing touch you can use store-bought balsamic glaze, or you can make your own! 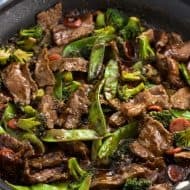 I never thought to make my own before reading my friend Ashley’s post on how to make balsamic glaze. Uhh guys, it’s one ingredient – balsamic vinegar! I’m so glad to have a batch sitting in my fridge ready to roll for bread dipping and the occasional crostini-for-dinner situation, like these babies. Some of my closest blogging friends and I have gotten together to celebrate one new mama and two mamas to be – Natalie, Isadora, and Jess. 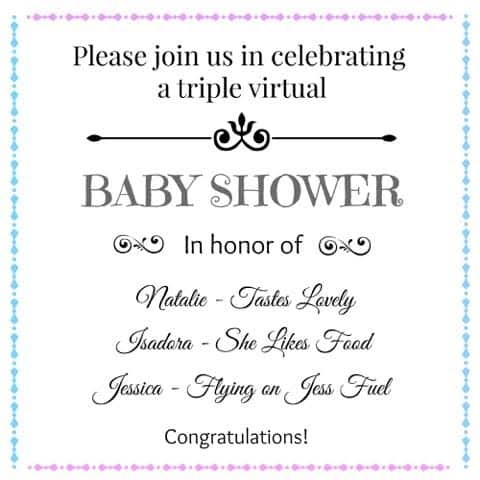 ♥♥♥ Besides warm wishes, hugs, and inevitably a cake inscribed with “showers of happiness”, what better way to mark the occasion than throwing a virtual baby shower! 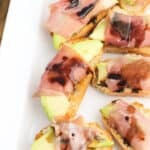 Below the recipe for these prosciutto-wrapped avocado crostini, check out the other bite-sized appetizers and desserts my blogging friends have shared today! Situate an oven rack near the top of your oven, leaving 4-5 inches from the top. Set oven to broil (see note) and let it heat for a few minutes. Slice baguette on the diagonal in slices about 1/2" thick and brush both sides of each slice with olive oil. Place baguette slices on a baking sheet lined with foil in a single layer. Place sheet in the oven and let the baguette slices toast for 2-3 minutes, watching carefully as they can burn very quickly. Remove the sheet from the oven when the edges are browned and the tops of the baguette slices are golden, but still a little bit soft to the touch. 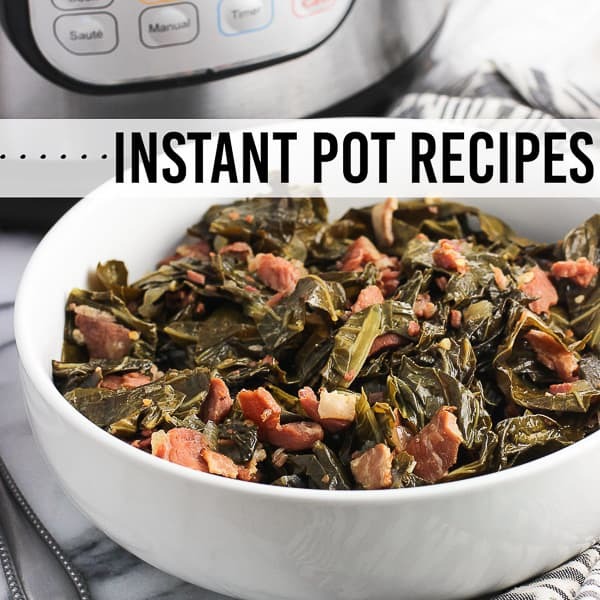 Let cool as you prep the rest of the ingredients. Slice avocado into thin wedges and slice each piece of prosciutto into three equally-sized strips, length-wise. Wrap each avocado wedge with a strip of prosciutto. Place prosciutto-wrapped avocado wedge on a piece of toasted bread. Before serving, drizzle balsamic glaze over top of each crostini. My oven gives me the option to select a broil temperature. In this case I set it at 500 degrees F.
This recipe is certainly adaptable to serving size. 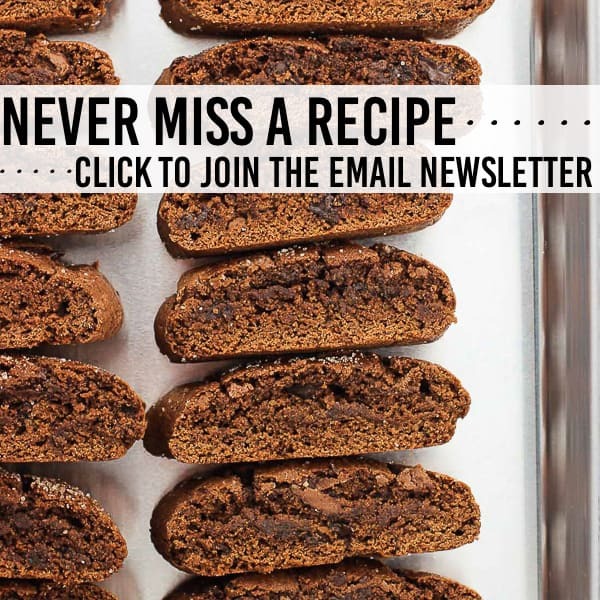 Feel free to increase the quantity of ingredients to feed your crowd! I love these!! 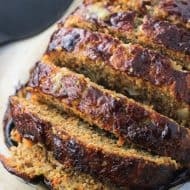 Such a great combo of flavors and textures! And balsamic glaze pretty much makes everything amazing. Thanks so much for the fun surprise shower!! You ladies are the best! XOXO. Well this is just the nicest surprise! 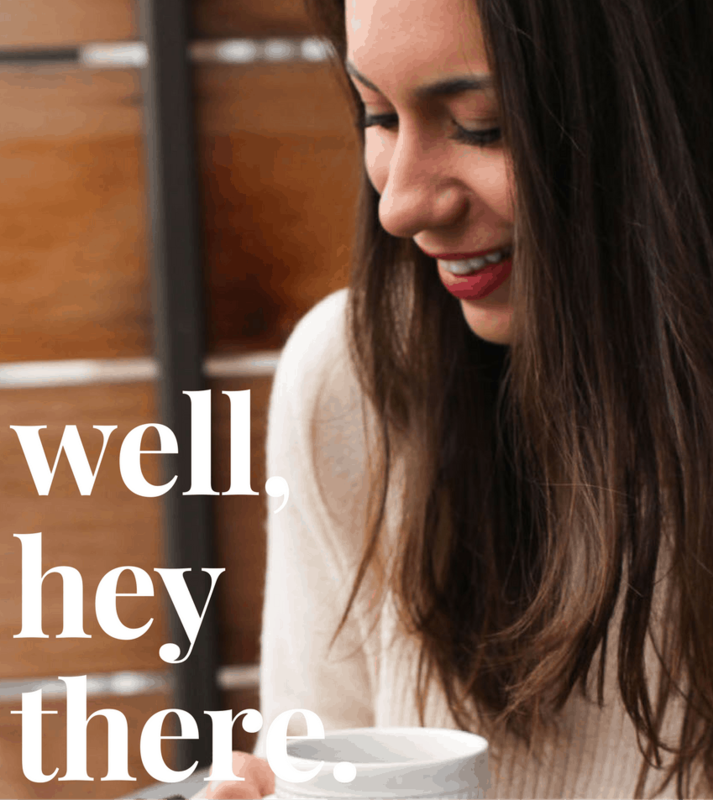 I’m so lucky to have you as a blogging friend. These crostinis sound delicious! And I just discovered that Coscto carries proscuitto, and I bought an insane amount of proscuitto there. I need ways to use it up. This is perfect! Appetizers for supper is the best – we love doing that! And these look just amazing, I can’t wait to try them out next time we don’t bother with anything but appetizers! Such a fun dinner, right? Thanks Stacey! 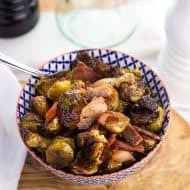 I would totally eat these for dinner with a glass of wine too, haha! Sounds perfect! I love little toasts like this and I bet all these flavors are awesome together! Thank you!! Love being able to celebrate you all, even ‘virtually’. 🙂 Thanks Izzy! I highly recommend them as dinner, Denise! I’ve added prosciutto to my Saturday shopping list so I think another round of these is on the menu for me tomorrow. 🙂 Thanks! Yay for balsamic glaze!! I’m so glad you found it helpful!! I make that stuff all the time .. it’s slightly out of hand 🙂 And on top of these crostini?? I love the avocado prosciutto combo! That sounds fantastic! Oh I love it!! It’s perfect, doesn’t need any sweetener at all. 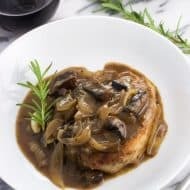 I always have a ton of balsamic vinegar hanging around, and I love that I don’t have to buy pricey store-bought glaze. The best! Aww I just love avocado. Pretty sure I’d eat them with every meal if I could! Ohhh!! These flavors are outrageous! 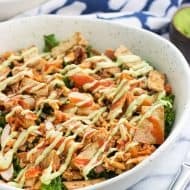 Creamy avocado with salty proscuitto?! Yes please! Alyssa, I would make a meal out of these! There’s almost every food group here, after all. 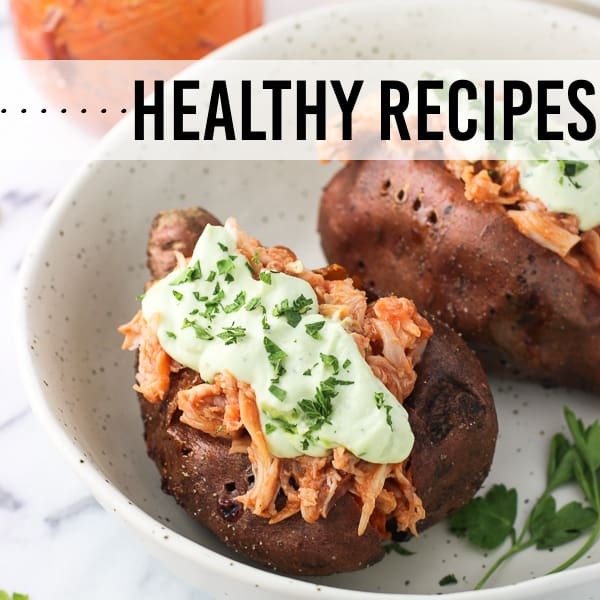 🙂 Gorgeous photos and I love how creative they are — the proscuitto with the avocado sounds delicious! Crostini’s are always a winner in my book. I just want to eat two dozen of them and call it dinner! 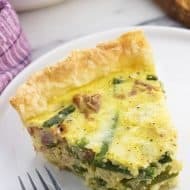 The avocado on here is a great touch! Ohhh I love them. Crostini for breakfast, lunch, and dinner please! Thanks Liz! Wow I’m loving this appetizer, Alyssa! It’s all of my favorites in one! 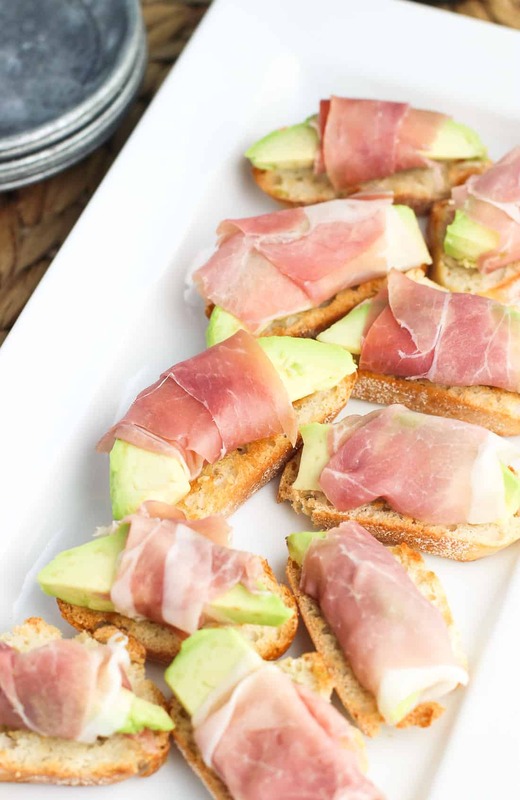 Prosciutto and avocado sound SO good. What a perfect bite-sized treat! There’s so much droolworthy goodness going on in this crostini I can hardly stand it! And eeee! Those wrapped avocado slices are making me positively giddy with excitement! Thanks Sarah! Gotta go wrap avocado slices…so easy and so flavorful! !